In the News - HeliCat™ 22 -- UNLEASH the 007 in your SOUL! HeliCat® 22 -- UNLEASH the 007 in your SOUL! For use as needed. Please email Sandy@Helicat.net to notify of usage. Thrillist "HeliCat is the Frankenboat of Your Dreams"
Stupid Dope "HeliCat 22 Catamaran: First Look"
Auto Evolution "Meet the HeliCat 22, The Catamaran That Will Make You Run Like James Bond"
Daily Mail "The Catamaran Shaped Like a Helicopter"
New York Boater "HeliCat Catamaran"
Car Revs Daily "HeliCat 22 at Miami Boat Show"
Gizmag "Helicopter-inspired Catamaran Flies Over Rough Water"
CNN Money "75K Boat that looks like a Helicopter"
Coastal Angler Magazine "Introducing the HeliCat"
Sun Sentinel November 2, "Ft Lauderdale boat show displays some intriguing watercraft"
Newport Beach Now "The HeliCat Hits Newport"
Soundings Online, April 18, "Ready for Takeoff"
Soundings Trade Only Today, April 23, "California Show Reports Record Attendance"
A Boat Time, April 18, "HeliCat, Sailing on a Helicopter"
MegaYacht News, April 11, "HeliCat, 2-Person Catamaran for Fast Fun"
MultiHulls Magazine, April 5, "Stable and Eye-Popping Fun"
NAVAGEAR, February 3, "The Weirdest Boat at the Seattle Boat Show"
Sailing Scuttlebutt Sailing News, April 15, "PHOTO: Honey, Look What I Bought at the Boat Show"
KTVU Channel 2 News, April 11, "Sailors are Heading to Oakland for Annual Boat Show"
The Log: California's Boating & Fishing News, March 31, "Super-Fast 22-Foot HeliCat Coming to Newport Show"
Go Boating (Australia), April 14, "HeliCat Coming to Newport Show"
InfoHome (Russia), April 12, "HeliCat 22: A New Toy for Superyachts"
Nauta360 Salon Nautico (Spain), April 17, "The Boat Helicopter"
Marine Business (Australia), April 9, "Weird Boats: The HeliCat"
Boating Business Online (Australia), April 10, "HeliCat Coming to Newport Show"
Pipuu, (Mexico), April 18, "The boat helicopter 'flies' over the water"
El Pergaminense, (Argentina), April 22, "The Argentine Half Boat Helicopter"
Captain Club (Russia), April 11, "HeliCat - Flying Catamaran"
Blog Post: Giz Wiz Biz, April 21, "It's a Boat, It's a Plane - No, It's a HeliCat!" Blog Post: Heidi North Homes, April 4, "What’s More Fun Than a Helicat???" 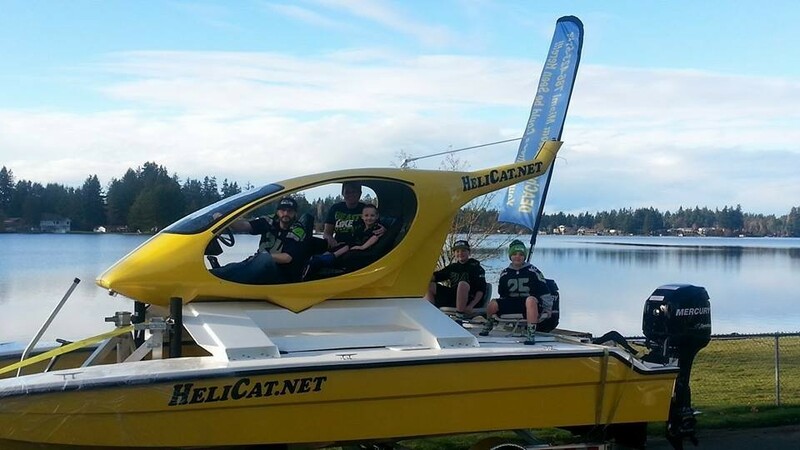 Blog Post: Newport Beach Now, April 17, "The HeliCat Hits Newport: Flying on Water"
Blog Post: Boat Safe, April 18, "Super-Fast 22-foot HeliCat Coming to Newport Show"
We were with the reporter, camera man and boat show PR person for 2.5 hrs today. 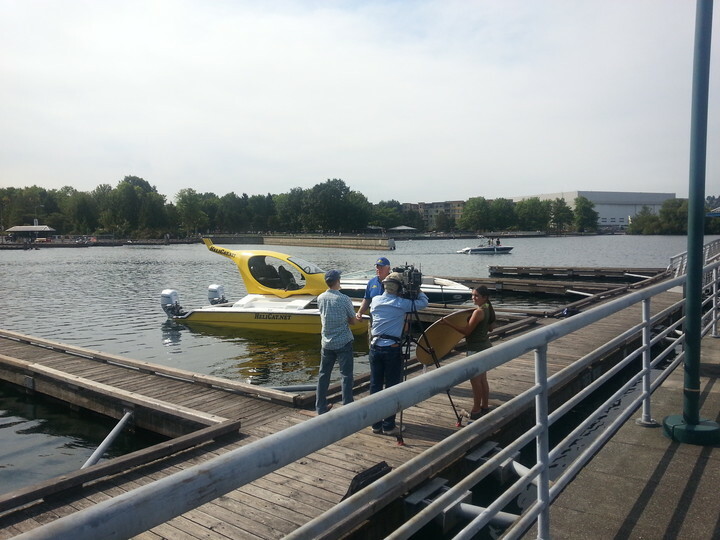 they shot with the TV cam and go-pro from the dock, an interview, from dock shooting boat. from chase boat and from the Helicat itself. We will get a link to the web video when it airs and I will post here and on website. I will buy a dvd for after the link goes away. you cannot download only stream it from their web site. They might have had a helicopter for the shoot, but it was in the shop today. What are you going to do on this demonstration trip to the Bahamas? We are going from Miami to Bimini Island, which is only 50 miles but we will be out of site of land for most of the trip and are crossing the Gulf Stream where the weather and seas can change really fast. What’s different about taking this trip in the Helicat? It’s the combination of fast and stable with great fuel economy. Doing 20-30 mph in whitecap waves while getting 5 mpg which is not possible in other boats. What makes it safe to do this trip in the light small Helicat 22? Being a catamaran it is stable. Having twin motors with separate fuel tanks give redundancy. The Helicat can run over 15 KN with one motor. It has positive foam flotation AND 10 separate hull flotation compartments -- in case you hit something and take on water, you could probably keep going, just a little slower. There is no hull cavity to trap water so you could take green water over the bow and the boat stays stable. Most small normal boats that take on a lot of water from an unusual wave become unstable with the water sloshing to the low side and less maneuverable due to the weight added. What is New, different, and better about the HeliCat? · Fun like a jet ski but you stay dry, are safer, and have room for others and stuff. · Spray can cover the boat and you stay drier. · Open air fun ride like a motorcycle but no risk of traffic or crash injury and 3 can ride. · Boats are for fun and entertainment- you might as well draw a crowd! · It can go to the Bahamas but be towed by a mid-sized car and is low maintenance. What else is new with this design? With its modular design, we could mount any sports or specialty convertible car body on the Helicat hulls. You could have an easy-up quiet and totally dry convertible top like a car with doors and roll up windows for easy entry and convenient adjustment for different weather conditions. There are lots of fiberglass kit cars on the market which would be suitable for mounting on the Helicat hulls.